The Romeo y Julieta Petit Churchills is a tasty and balanced medium bodied Petit Robusto, 4" (102mm) long, of 50 ring gauge, and comes in a 25 cigars box. Great success since it was released in 2004, all the major brands released such a vitola, with their own typical aromas but with the same characteristics. The Petit Churchills is Romeo y Julieta response to Cohiba, Montecristo, Partagas and Trinidad. Like all Petit Robustos, it is a short and robust cigar, which is quick to smoke but doesn’t compromise on the coolness and the comfort of a larger ring gauge. It has both and it keeps the typical Romeo y Julietta Churchills flavors. Romeo y Julieta Petit Churchills are the latest addition of Churchill release of Habanos. • It has the perfect format to savor the balanced and aromatic flavors of classic Romeo y Julieta. • It has perfect smoking thanks to wide ring gauge and moderate length. 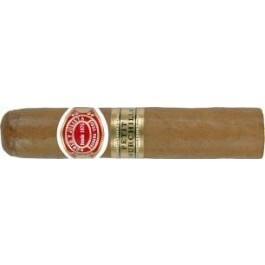 Retains the classic Romeo y Julieta Churchills flavors in a small format. The appearance of the Petit Churchills is close to perfect. The wrapper is shiny and has a soft touch, only some tiny veins appear. The cigar is firm and thick. The triple cap is flawless, round and looks wonderful. Strong scents of wild flowers and walnuts emerge from the foot and the wrapper of the cigar. The pre-light draw is perfect. The first third greets you with strong flavors of vanilla and honey. Overall it is very creamy and sweet, but there is a bit of bitterness with a hint of wood. The balance of flavors is awesome and the flavors are medium in strength. The cigar reveals its complexity all along this first third, some coffee, some dry fruits, bitter chocolate, and some leather aromas. In the background, there are also some notes of cedar. The amount of smoke produced by the cigar is generous and the burn line is nice. In the second third the cigar settles down and the Petit Churchills is now sweeter. Honey, vanilla and coffee are the main flavors, with some cedar and earth still in the background. The body is still medium and the cigar draws well. The last third reveals a much stronger cigar, with a medium to full body, where all the flavors are even more noticeable, like in the first third. We get the strong flavors of bitter chocolate, soil, leather and wood again while the sweeter and creamier flavors fade away. It never gets too bitter nevertheless, so the final third is still much enjoyable. The smoke created by the Petit Churchills is still plenty and the cigar never gets too hot or too harsh anywhere in the last draws. In summary, it kicks off with sweet and earthy flavors turning to sweet on the second third and finishing off with a bit of a kick. Great progression for a cigar of its size.